Small: 16 to 26 lbs. Medium: 24 to 34 lbs. Why swell up like a beach ball when you're playing in the water? 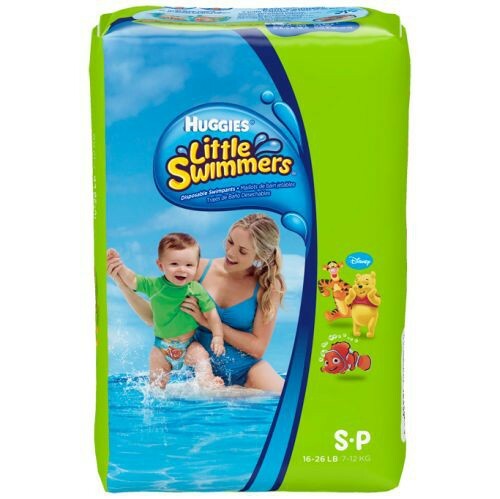 HUGGIES Little Swimmers disposable Swimpants allow for worry-free water play. HUGGIES Little Swimmers Swimpants feature everyone's favorite Disney and Disney/Pixar characters. All characters are available in all three sizes to fit infants and toddlers. Unique absorbent material won't swell in water. Special leak guards help protect. Stretchy sides for a comfortable fit. Back label helps kids tell back from front.